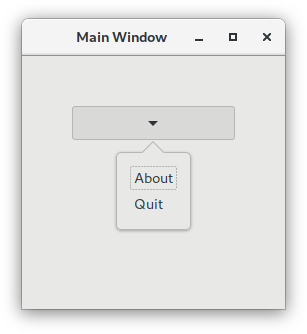 The Gtk.Popover is a seperate window used for displaying additional information and are often used as a part of button menus and context menus. Their uses are similar to those of dialog windows with the advantage of being less disruptive and having a connection with the widget the popover is pointing to. Popovers have are visually connected to a related widget with a small triangle. 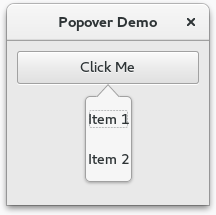 A Popover can be created with Gtk.Popover; for opening the popover use Gtk.Widget.show_all(). A widget can be added to a popover using the Gtk.Container.add(). A popover can be created from a Gio.MenuModel using Gtk.Popover.new_from_model() and can be changed after creation with Gtk.Popover.bind_model().